Add references to other assembly definition files in the Project using the Inspector too. To view the Inspector, click your Assembly Definition file and it should appear. To add a reference, click the + icon under the References section and choose your file. To mark the assembly for testing, enable Test Assemblies in the Inspector. This adds references to unit.framework.dll and UnityEngine.TestRunner.dll in the Assembly Definition file. 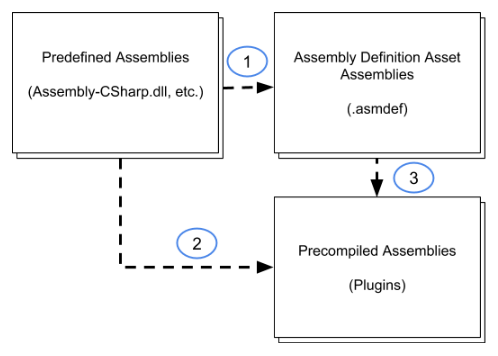 Predefined assemblies (Assembly-CSharp.dll etc.) do not automatically reference Assembly Definition Files flagged for testing. The assembly is not included in a normal build. To include the assemblies in a player build, use BuildOptions.IncludeTestAssemblies in your building script. Note that this only includes the assemblies in your build and does not execute any tests. Note: If you use the unsafe keyword in a script inside an assembly, you must enable the Allow ‘unsafe’ Code option in the Inspector. This will pass the /unsafe option to the C# compiler when compiling the assembly.